What is Fairhope Soccer League (FSL) and is it the right place to register my child for recreational soccer? Fairhope Soccer League (FSL) is the recreational soccer program serving the Fairhope area as well as surrounding areas. FSL is a volunteer organization that has partnered with the City of Fairhope to provide the equivalent of city-league youth soccer. FSL is open to players of all skill and athletic levels and there are no try-outs required. FSL provides parent volunteer coaches. Fairhope Soccer League (FSL) gives ages 3-15 players the opportunity to have fun playing soccer, learn fundamentals, and get some good fitness. At what age can a child be registered to play? 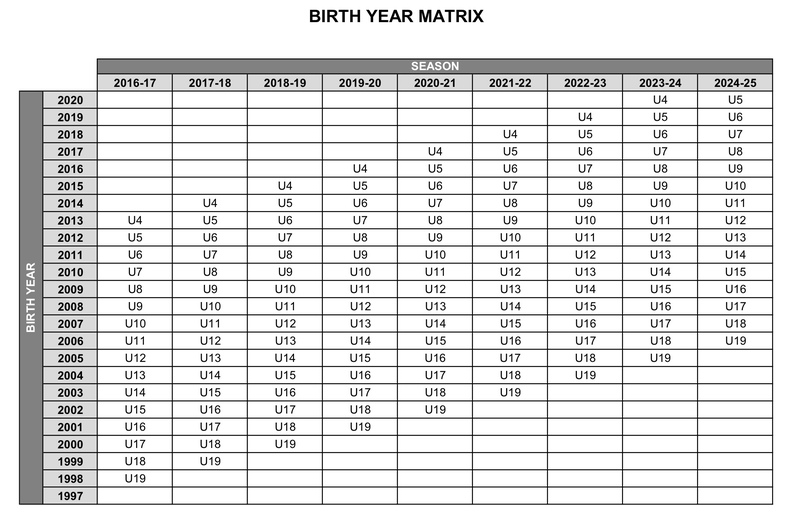 FSC uses the US Youth Soccer Birth Year Matrix to register our players. Recreational soccer begins at U6 through U12. A seasonal Year is from August 1st, 2018-July 31st, 2019. Players registered at U8 this fall, will continue to play U8 in the Spring. “U followed by age” really means that age & younger. We also have Fairhope Tots U4 & Fairhope Fives U5 programs. If this is my player's first year to play soccer but did not participate in Fairhope Fives/Tots programs, will he/she be behind? No, not at all. Half of our players have never played soccer before or participated in our Tots/Fives programs. Our main focus is FUN, while learning the basics of soccer. Note: We have many new players in every age group that have never played soccer before. Our main focus is FUN, learning the basics of soccer & new players tend to learn from those with some soccer skills. When can I register & how much does it cost? Yes. ALL Players MUST register online using Demosphere/TeamNet. We also use this system for ALL communications. If you do not access to a computer for online registration or having difficulties, please contact us. When does the when do practice start, when do I hear from my coach, etc? The answer to ALL these questions, please visit General Information. We try to keep the website information current & up-to-date. Also, we suggest you to "Like" our Facebook page @fairhopesoccer. When and where are the practices? Each coach sets a practice schedule at his/her convenience. They are usually on weekday evenings after work hours, but could be any time that suits the coach’s schedule. ALL practices will be at Fairhope Soccer Complex. We utilize a Sign Up Genius to reserve practice space for the season. Will my child have to try out for a team? No. All children will be placed on a team. What does my child need to play? All players will receive a jersey, shorts & socks for game day. Players MUST bring a ball & hydration, wear soccer cleats, shin guards to every practice & games during the season. For safety reasons, players without shin guards or appropriate footwear will not be allowed to play. Please note that baseball, softball or football cleats may not be allowed, especially if they have a cleat in the front. Correct soccer cleats can be bought cheap, please get them. I don’t have any coaching experience, should I volunteer? Yes. Recreational soccer is primarily meant to be fun. FSL is more interested in a positive attitude and a desire to learn, than any soccer experience or credential. We depend entirely upon volunteer parent coaches. As such, you are encouraged to volunteer through the online registration process. Even if you do not, you may be asked to volunteer if we are short coaches. Please be open to this. As indicated below, FSL offers a coach’s clinic that will provide you with all the information about the game and practice drills and tips you will need for a successful season. We also have many experienced parents and the coaching staff of Fairhope Soccer Club available to help. Will there be a coaching clinic for parents? Yes. To be announced. Please wear appropriate clothing and footwear as this is an active clinic. All head coaches will receive a coaching discount. We will also provide email communications regarding training sessions to ensure that all our FSL volunteer coaches have the tools to be successful. May my child wear earrings or other jewelry on the field? It is FSL policy that for safety reasons, players are not allowed to wear earrings, jewelry, metal hair accessories, or any other items a coach, referee or other FSL representative deems dangerous on the field. PLAYERS ARE DISCOURAGED FROM GETTING THEIR EARS PIERCED IMMEDIATELY PRIOR TO OR DURING SOCCER SEASON IF THEY ARE NOT PREPARED TO REMOVE THE EARRINGS FOR PRACTICE AND GAMES. Tape and bandages over such items is not acceptable as it easily comes loose. Can my child play with a cast? Can I request a coach or that my child be placed on a team with a friend? No. If you volunteer to coach, you can name one assistant and your children will then be together on your team. Please note that you should discuss the assistant being your assistant and make sure that they register to be an assistant. If they do not register to be your assistant you may not get them. Siblings in the same age group will be placed together unless specified otherwise. My child is really good and/or physically big. Can he/she play with an older age group? Or my child is not very good and/or is physically small. Can he/she play with a younger age group? Generally, recreational players should play in their true age group. In exceptional circumstances, however, a player may be approved to play up if approved to do so by Director of Coaching. If there is any question as to whether the player should be approved to play up, an evaluation of the player under the supervision of our Fairhope Soccer Club coaching staff may be required. For a request to play up to be considered, the request must be made by e-mail to the FSL Chairperson prior to the close of registration. Otherwise, the player that has the ability and wants a higher level of training, you should consider either Fairhope Footies for additional training with in FSL, Fairhope Academy(U9-U12) or Gulf Coast Rangers FC (U13-U19). Players may not play down an age group. Can you provide more information on the uniform sizing options? At this time we cannot provide an exact scale. If you are not certain whether a size may be correct for your player, our recommendation is to order one size larger. The goal of Fairhope Soccer League is for the children that participate in our league to get fit, have fun and play Soccer. In order for our children to have the best experience possible, it is important that we as Parents, Coaches, Officials, Volunteers, Administrators and Soccer Fans set a good example for our children. FSL has, therefore, established this simple Code of Conduct which all adults are expected to honor at all times when participating in or attending FSL meetings, practices, games, tournaments or other related activities. Encouragement. No child enjoys participating in an activity if there is no one there to pat him or her on the back when they succeed and even more importantly encourage them when they are struggling to succeed. Negative comments will not be permitted. Respect. Players and all adults are expected to be respectful to all coaches, referees, volunteers, other players and other parents. No foul language will be permitted and all adults and players are expected to conduct themselves in a civilized manner. This is especially true when it comes interaction with referees and coaches. All calls are final and while coaches may request an explanation of a call, neither coaches, nor fans will be allowed to argue with, harass or otherwise be disrespectful to the officials. Coaches may ask parents for their thoughts on matters such as practice time, but the final decisions on coaching methods, practice schedule and the like are up to the coach as his or her schedule may permit. Let the coach. Coaches are expected to also be respectful to their players and the parents. Good Sportsmanship. There is nothing wrong with supporting your child, unless, your conduct has a negative effect on your child’s teammates or the children on the other team. While season and tournament ranking sometimes comes down to goal differential, it is more important that your child learns to be a humble winner than it is to be ranked #1 in the local recreational league. Our children learn from our example. Be good teachers. Players will have greater success in Soccer by learning that playing hard, clean, skillful and honest is more important than winning. Attendance. It is essential that everyone, whether player, coach, or volunteer, fulfill the commitment they make. Show up for all practices, games and other activities that you have committed to on time. If you are not there then someone else will be negatively impacted. Please pick up after yourself and children (including disposing of all trash and drink cans/ bottles in the trash/recycling containers provided). Please respect the facilities, including the fields, concession stand, restrooms and goals and nets. Do not allow children to climb on the goals and nets. Please drive with caution in the parking lot. WE prefer pets stay home during the season, however if you need to bring them to the soccer complex please keep on leash & clean up after your pet. No PETS are allowed on playing fields.